Whenever I go get an oil change (often, whenever I find myself with a good coupon to a local oil change service provider), I always notice that little sticker in the corner of my windshield that they affix during the oil change. Usually, it lists the mileage at which I should get my next oil change (according to them) and often lists the approximate date at which I should reach that mileage. The only problem is that, without fail, that mileage revolves around getting an oil change every 3,000 miles. An oil change that often just isn’t necessary. It’s akin to getting an annual checkup at the doctor every six months. Let’s just say I tear that sticker off. We’ve all heard the mantra of getting your oil changed every 3,000 miles. It gets repeated to us every time there’s an ad for motor oil or oil change services. That actually might have been true thirty or more years ago, when engines were built very differently than they are today. However, the reality is that most of today’s car models require oil changes every 5,000 miles, and some models require it even less frequently than that. The information you need is (again) in the owner’s manual for your car. It tells you the exact number of miles recommended for your car between oil changes. For most modern models, it’s 5,000 miles between a change. So, how much does that save you? Let’s look at a 120,000 mile life span for your car. I have a pile of coupons for a Jiffy Lube oil change (including oil) for $29.95, so we’ll use $30 as a base price. With an oil change every 3,000 miles, you’ll have to change the oil 40 times. That’s a total cost of $1,200 over the car’s lifespan just for oil changes. With an oil change every 5,000 miles, you’ll have to change the oil only 24 times. That’s a total cost of $720 over the car’s lifespan just for oil changes. That’s a savings of $480 just by cutting out unnecessary oil changes. Not only that, oil changes every 5,000 miles put you in line with the rest of the maintenance schedule (also found in your car’s manual) in most modern cars. If you have an oil change every 3,000 miles, you’re going to be very out of whack with that schedule, causing you to either delay other maintenance (risky) or get oil changes even earlier (expensive). 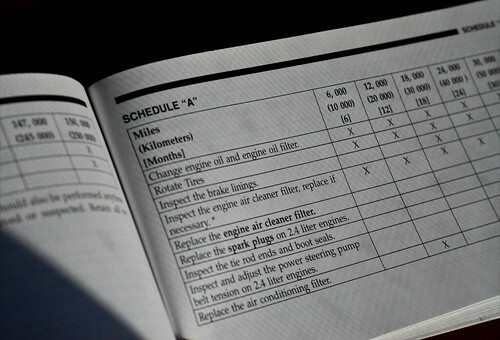 Take a peek at your car’s manual and see what it says about oil changes. You might just find yourself ripping that little sticker off, too.